Today is Ratha Yatra Day. May Lord Jagannath, Lord Balabhadra and Goddess Subhadra bless you all on this auspicious day. Ratha Yatra or the Car Festival is a huge Hindu festival associated with Lord Jagannath held at Puri in the state of Orissa, India. Now a days it is also celebrated all over the world. This annual festival is celebrated on Ashad Shukla Dwitiya (second day in bright fortnight of Ashad month). 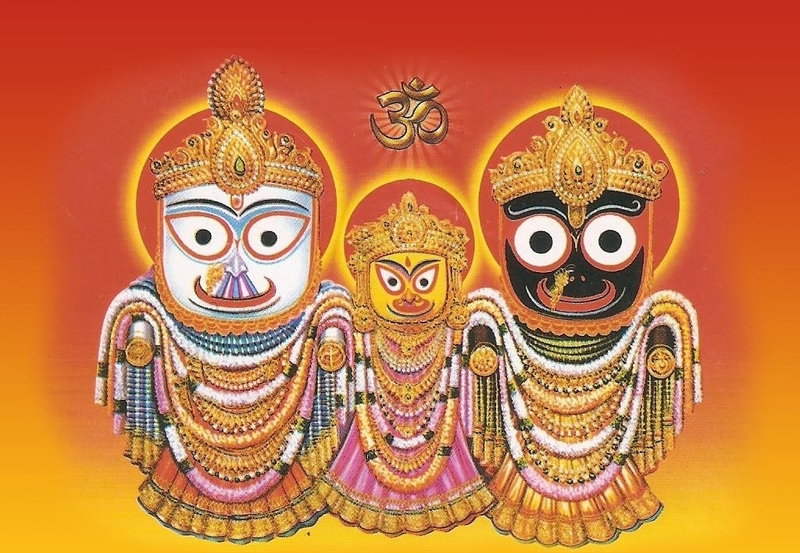 The festival commemorates Lord Jagannath's annual visit to Gundicha mata's temple via aunt's home (Mausi Maa Temple which is near Balagandi Chaka in Puri). 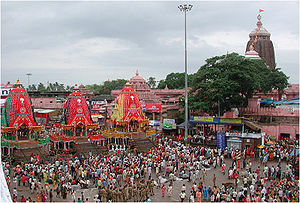 As part of Rath Yatra, the presiding deities of the Jagannath Temple, Puri main temple, Lord Jagannath, Lord Balabhadra and Goddess Subhadra, with the celestial wheel (Sudarshana Chakra) are taken out from the temple precincts in an elaborate ritual procession to Gundicha Temple and remain there for nine days. On their way back from the Gundicha Temple, the three deities stop for a while near the Mausi Maa Temple (Aunt's abode) and have an offering of the Poda Pitha, which is a special type of pancake supposed to be the Lord's favourite. After a stay for seven days, the deities return to their abode.The return journey of Puri Jagannath Rath Yatra is known as Bahuda Yatra. Buddhim tu sarathim viddhi manaha pragrahameva tu. the fields of pasture for the horses. i.e. The person whose Sarathi - intellect - is wise, whose mind fully controls the senses, can traverse Samsara to reach the desired goal - the Lord's abode. pura Ashwamedha sahasrasya mahabedi tadadvabat. Those who are fortunate to see the deities of the Srimandira in the Gundicha Temple, the final destination of the procession of the chariots, derive the benefits of a thousand horse sacrifices, an immensely pious deed. Kabi Samrat Upendra Bhanja in his famous Vaidehisa Vilasa mentions: The Lord comes out from his sanctum for participating in the Gundicha Jatra (another name of the Festival of Chariots) only for redeeming the fallen, the patita jana who get the opportunity to behold their dearest god at close quarters on this occasion. The Lord swaying and moving like a wild elephant arrives at the Grand Avenue and rides his chariot and destroys in a flash all the sins of his devotees, even if these may be grave or unpardonable. The Ratha Yatra festival has become a common sight in most major cities of the world since 1968 through the ISKCON Hare Krishna movement. Its leader A.C Bhaktivedanta Swami Prabhupada successfully transplanted the festival which now happens on an annual basis in places all over the world in over 100 cities including Dublin, Belfast, Birmingham, London, Bath, Budapest, Melbourne, Montreal, Paris, New York, Singapore, Toronto, Antwerp, Kuala Lumpur and Venice, CA. The Rathajatra in Dhamrai, Bangladesh is one of the most important in Bangladesh. Many believe that the custom of placing idols on grand chariots and pulling them is of Buddhist origin. Fa Hien, the Chinese historian, who visited India in the 5th century AD, had written about the chariot of Buddha being pulled along public roads. The festival begins with the Ratha Prathistha or invoking ceremony in the morning, but the Ratha Tana or chariot pulling is the most exciting part of the festival, which begins in the late afternoon when the chariots of Jagannath, Balabhadra and Subhdra start rolling. Each of these carriages have different specifications: The chariot of Lord Jagannath is called Nandighosa, has 18 wheels and is 23 cubits high; the chariot of Balabhadra, called Taladhvaja has 16 wheels and is 22 cubits high; Devadalana, the chariot of Subhadra has 14 wheels and is 21 cubits high. Each year these wooden chariots are constructed anew in accordance with religious specifications. The idols of these three deities are also made of wood and they are religiously replaced by new ones every after 12 years. Rath Yatra is a great festival because of its ability to unite people in its festivity. All people, rich and poor, brahmins or shudras equally enjoy the fairs and the joy they bring. You will be amazed to know that even Muslims participate in Rath Yatras! Muslim residents of Narayanpur, a village of about a thousand families in the Subarnapur district of Orissa, regularly take part in the festival, from building the chariots to pulling the rath. Lord Jagannatha is identified fully with Vishnu and Krishna. In his original manifestation as Nilamadhaba, he was worshipped in a sacred Nyagrodha Briksha or banyan tree. The branches of the tree had spread for several miles and any one entering this area was instantly emancipated and was relieved of the travails of the birth and re-birth. In fact, the influence of Yama, the God of Death, is supposed to have been curtailed in the sacred city of Puri – Srikshetra on account of the presence of Lord Jagannatha and therefore it is also called the Yamanika Tirtha.